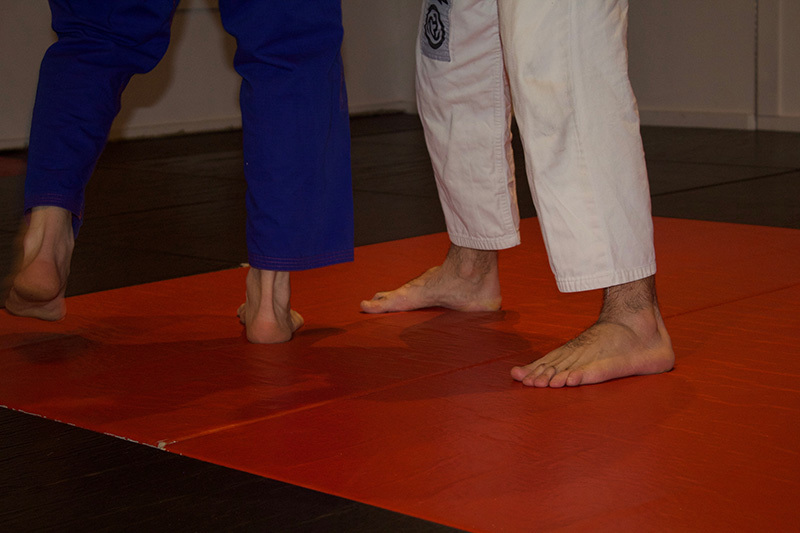 Brazilian jiujitsu promotes discipline and self-defense. I’ll be honest, I didn’t know much about Brazilian jiujitsu prior to writing this piece. I wasn’t even sure I was pronouncing it correctly [joo-jit-soo]. Aside from a quick Google search and a 30-second YouTube video, I decided to go into this with a learn-as-I-go approach. I sat down with Leonardo Bonjour, who is without a doubt the person to talk to when it comes to Brazilian jiujitsu. He speaks about it with simple, unmistakable passion, and an ability to convey that it is a profoundly important practice to him. Brazilian jiujitsu is a martial art and combat sport system that focuses on grappling and ground fighting. It looks a lot like wrestling, but with more ground time. Bonjour isn’t a master or a black belt, not yet, but he assists at Blitz Fitness in West Tisbury, where classes are offered four times a week. Devin Church is the guy in charge. 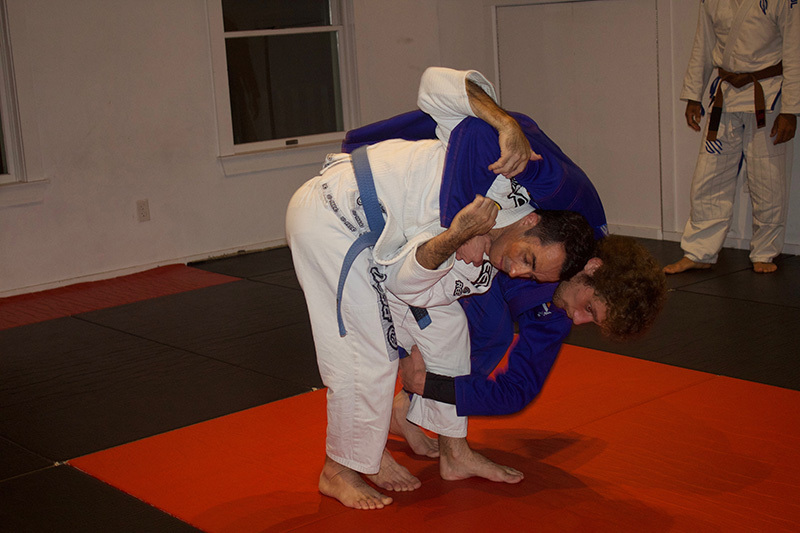 He’s a Brazilian jiujitsu brown belt, and instructs all adult classes at Blitz Fitness. Above Church is Rodrigo Vandre. He recently moved off-Island due to housing, but he’s still a resource. Bonjour referred to him as “professor” or “sensei” throughout our interview. He’s able to move students from white belt to blue, to purple, brown, and black. Vandre struck me as the top dog when it comes to the martial art around here. Bonjour is a blue belt, and hopes to someday be able to teach others. He’s originally from Brazil, and moved to Martha’s Vineyard in 2006. 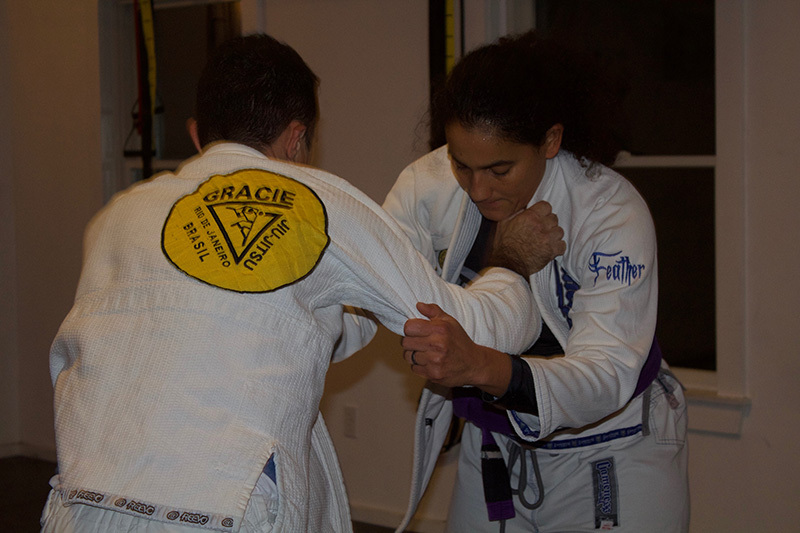 Brazilian jiujitsu was started by the Gracie family — a well-known family in Brazil, now well-known across the globe. The legacy started with Gastao Gracie in the early 1900s. He bought out the American Circus, and moved his family to Rio de Janeiro, the greatest city of Brazil at the time. Kom Di Coma was a Japanese jiujitsu fighter in the circus. Gastao’s sons Carlos and Helio learned all about the martial art through Di Coma, and eventually opened the first Gracie jiujitsu gym in Rio de Janeiro in 1925. Over time, the Gracie brothers developed new ways to apply jiujitsu, with the idea of leverage using the opponent’s own body or kimono. All jiujitsu fighters wear a kimono, or a “gi.” This new form of the combat sport uses choke setups and armlocks. 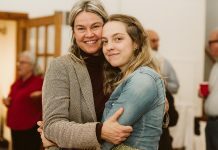 Gracie’s jiujitsu academy was getting bigger and bigger, and people from all over Rio de Janeiro were showing up to try this new type of self-defense. All sorts of black belts and martial art masters showed up, and most of them ended up staying, and signed up for classes. According to Bonjour, their way of fighting is closely linked to what is known today as UFC fighting. 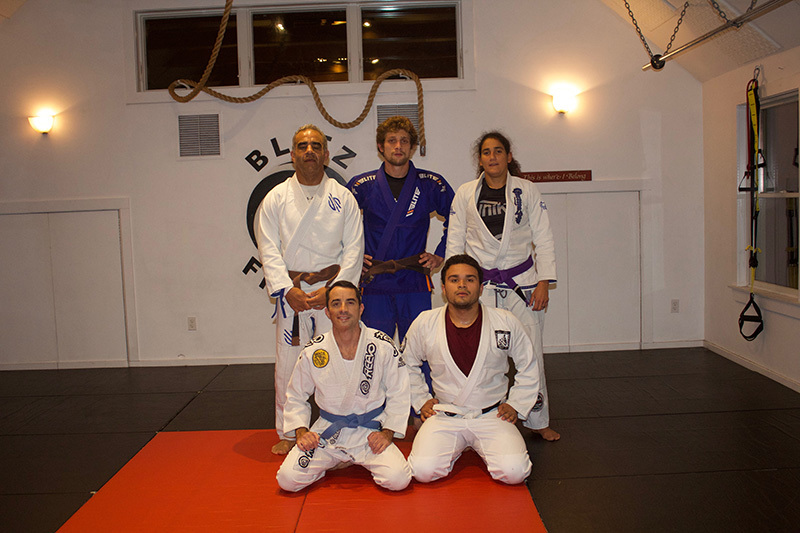 The Times joined Bonjour for a Monday evening jiujitsu class at Blitz Fitness. Instructor Devin Church led Bonjour, Daniel Lacerda, Aaron Araujo, and Neila Silva through an hour and a half of training. Each student bowed before entering the space. The session began with warmups — walking, running, jogging, high-knees, pushups, and sit-ups — like any other sports warmup. They partnered up, and Church used Bonjour to demonstrate different defense tactics to get out of chokes, grabs, and strangles. There were a lot of tucks, rolls, and slams against the mat, and use of weight displacement and leverage for takedowns. Church, in his calm, low-toned voice, reminded students to “keep the movement fluid,” and to “always face the opponent” — learning, teaching, demonstrating, and a desire to be better. 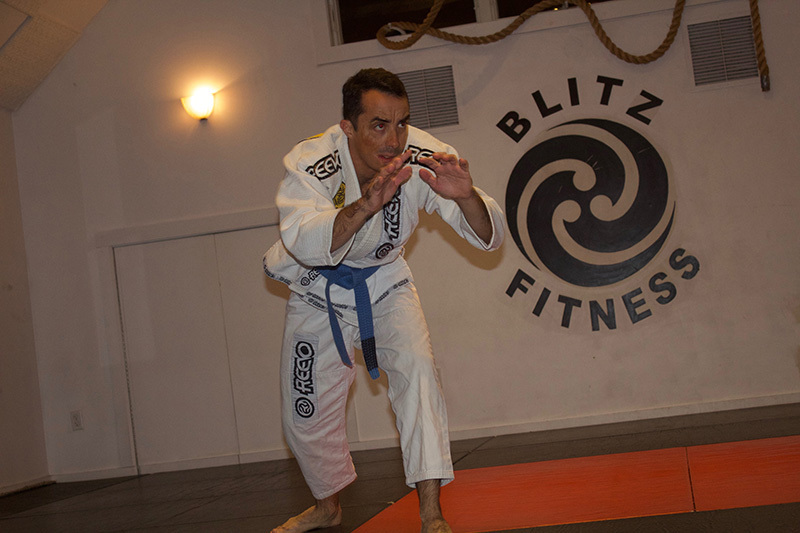 Brazilian jiujitsu is offered at Blitz Fitness four times a week. On Mondays, Tuesdays, and Thursdays, it’s offered to adults of all ages from 7:30 to 9 pm. On Tuesdays, it’s offered at 6 pm for kids age 5 and up by instructor Cord Bailey. For more information, call 508-776-7031. Previous articleGarden Notes: Does it really need mulch?